When Bruce Springsteen gives the keynote address at SXSW in a couple weeks, it's not just folks in Austin who will get to hear it. NPR Music, which is streaming "Rocky Ground" today, has also announced that they'll be broadcasting a live webcast of Bruce's speech, at noon Central on March 15. 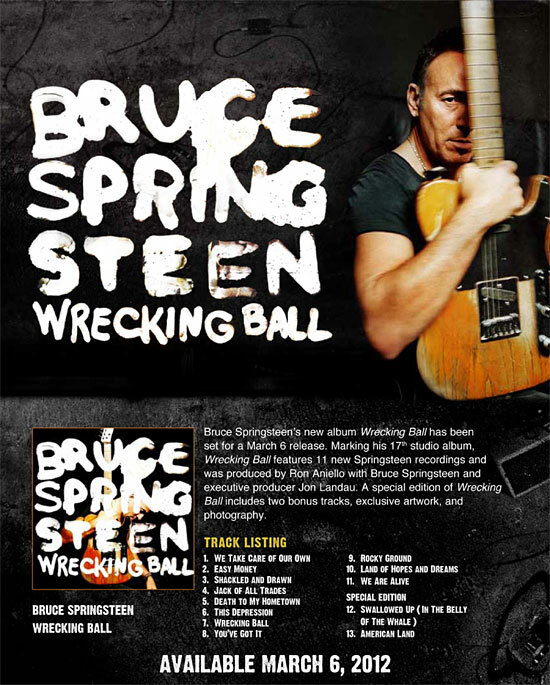 Wrecking Ball is Bruce Springsteen's sixth album of original material since the founding of the Bruce Springsteen Special Collection. Expecting reviews from around the globe, managers of the Collection are inviting fans to help documenting reactions to the album and performances by the E Street Band. If you would like to join in making Wrecking Ball the most thoroughly archived album in the Collection of books, magazines, fanzines, ticket stubs and more, click here to learn how. 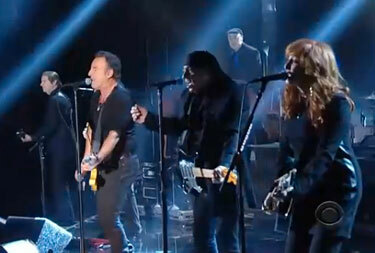 Bruce and the E Street Band kick off Bruce Springsteen week on Late Night. Tonight kicks off Bruce Springsteen Week on the Late Night with Jimmy Fallon. Suffice it to say that it has been a long time since legendary Studio 6B in the GE Building rocked this hard, this loud. Most audience members had gotten their tickets weeks ago, not knowing who was scheduled as the musical guest. But they had found out by the time they walked into the studio this afternoon, and they were not the only ones who were excited. Fallon, who does a fabulous Springsteen imitation — and who convinced the Boss to appear in November 2010 as an earlier version of himself, circa 1975, to perform Willow Smith's "Whip My Hair" — could hardly contain himself. The rehearsals, he told the audience, were "off the chain." Fallon showed the cover of Wrecking Ball and then went into his Springsteen voice to explain the title. The host couldn't take his mind off the subject and asked his first guest, Julianna Margulies, whether she had ever seen Bruce in concert. Talk turned to a Prince concert both attended. "Prince and Bruce," Fallon sighed as if he had discovered the musical DNA of the universe. With the next guest, Fallon managed to stay focused, but then it was time for a performance by Bruce Springsteen and the E Street Band. Twelve musicians squeezed into an area not much larger than a living room. Bruce, Patti, Steve and Nils in front. Garry a bit behind, as is his wont. Max, Charlie, Roy, Soozie, Curt, Curtis, and Cindy anchored the back. With a countdown they launched into "We Take Care of Our Own," and it felt to us as if the risers behind and to the side of the band would collapse. Following a short break, the band took on the album's title song which now gains new currency. It is not a novelty song written for the tearing down of Giants Stadium. It is the anchor to what promises to be a masterful album that compels us to think about the hard times that have come, and those that have gone. The structure of the show didn't allow for any more songs from Bruce. But Fallon's remarkable house band, The Roots, tore up the close of the evening. Springsteen stood there, electric guitar still in hand. And even though it was unplugged, even though people were scurrying all about waiting for Fallon's sign off, Bruce focused on The Roots and stood there strumming along. Springsteen week on Jimmy Fallon will continue with Kenny Chesney on Tuesday, the just-announced John Legend on Wednesday, and Elvis Costello on Thursday, all performing Springsteen songs. Friday night, Jimmy has Bruce and the E Street Band back as the sole guest. We had nearly 1,600 entries that provided the correct answer to this question: Last time Springsteen appeared on Late Night with Jimmy Fallon, he performed two originals and a cover song. What was the cover? The right answer: "Whip My Hair." We also accepted "Whip Your Hair." We did not accept "Whip It," "Hair in the Air," "Neil Young," "Heart of Gold," "Because the Night," "Born to Run," "Save My Love," or "No Surrender." All winners have now been contacted. Today, we've drawn names for, and contacted via email, a Grand Prize winner as well as the other 20 lucky folks who will be attending this week's tapings with a friend. We used the random number generator at Random.org to select winning entries. There's a chance we'll be dipping back into the pool to draw additional names, if anyone RSVPs with regrets, but we wanted to let everyone know that as of now, the slots have been filled. The rest of us can tune in to NBC each night this week at 12:35 a.m., with Bruce and the E Street Band themselves to appear on the show tonight and Friday night. "THIS IS THE IMPORTANT PART!" Bruce Springsteen with Boccigalupe and the Bad Boys at Saturday night's benefit for the family of Tony Strollo. The Press Room, Asbury Park, NJ. Below, Bruce backs Michael Strollo on "Could Die Young Tonight." 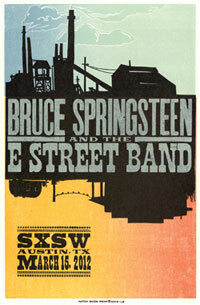 SXSW is extremely excited to announce that Bruce Springsteen and the E Street Band will be playing a special show in an intimate venue for SXSW attendees on Thursday evening, March 15th. To determine who will be admitted to this show, SXSW will conduct a ticket drawing. See sxsw.com/springsteenticketdrawing for full details. 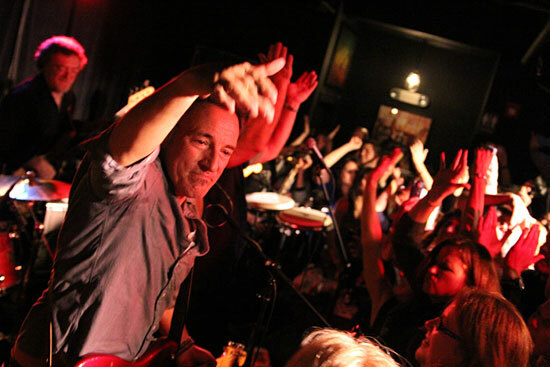 On Saturday evening the title of Bruce Springsteen's latest single, "We Take Care of Our Own," assumed new meaning as The Boss walked The Press Room planks with Boccigalupe & The Bad Boys, an all-star band of Jersey Shore musicians, in the name of lifetime Garden State resident and longtime Springsteen compatriot Tony Strollo. Strollo's recent passing at the age of 40 staggered the Asbury Park music community, which appeared in force for this musical fundraiser in support of Strollo's two daughters, Chloe and Grace, and wife Jana. From within downtown Asbury Park's newest late-night house of music, Bruce performed the role of the playful soul man to a capacity crowd of no more than 200 patrons, whose massive show of affection and exuberance coated the venue's picture window in condensation cutting off the outside world to the joys within. Springsteen traded verses with vocalist John Oeser on such classic compositions as "Soul Man," "Hold On, I'm Comin'," "Knock On Wood," and an electrifying rendition, with full brass accompaniment, of the "Detroit Medley," but not before joining Tony's brother and local solo artist, Michael Strollo, on stage. The pair shared a series of smirks between cuts from the penman's 2010 full-length release Bedroom Eyes, Strollo from underneath a spotlight and Springsteen, caked in shadows, upon a stack at the back of the stage. Bruce strummed along upon Asbury's own reggae-rock maestro Quincy Mumford's acoustic six-string, on songs including "Could Die Young Tonight," which Strollo admitted was his brother's favorite tune from the compilation. However, let us not forget why The Boss was in attendance, why members of the Boardwalk's music community congregated in The Press Room. It was for a man, a friend, a husband, and a father who left his mark on the souls of many and departed from this life far too soon. In the Jersey Shore's musical hub by the sea, they do indeed take care of their own. Springsteen & E Street Band to bookend Fallon's "Bruce Week"
Late Night with Jimmy Fallon will honor Bruce Springsteen with a weeklong musical tribute February 27 – March 2 (12:35 a.m. on NBC) to celebrate the March 6 launch of Wrecking Ball. Each night, the show's featured musical guest will perform selected songs from Springsteen's extensive catalog — and on two of those nights, the musical guest will be Bruce and the E Street Band themselves. Fallon welcomes Bruce and the band band to studio 6B on Monday, February 27, to open the week with two performances. Then, returning on Friday, March 2, which also marks Late Night's third anniversary, they will appear as the only guest for that episode. Springsteen will chat with Fallon for an interview segment before taking the Late Night stage again for multiple performances with the E Street Band. These Late Night appearances are the only currently scheduled American television stops prior to the massive world tour beginning March 18 in Atlanta. In between Monday and Friday, musical guests will include Kenny Chesney on Tuesday, performing "I'm on Fire" (previously released as part of the bonus tracks from his 2004 album When the Sun Goes Down), and Elvis Costello on Thursday, backed by The Roots and performing "Brilliant Disguise" (previously released as a B-side and on Light of Day: A Tribute to Bruce Springsteen). As reported previously, this week Dave Marsh began hosting a special daily one-hour edition of Live From E Street Nation on E Street Radio, in addition to his regular two-hour gig every Friday (which also will air in the 10 a.m - noon slot tomorrow). Dave's show has been previewing a track each day from Wrecking Ball (the same track released each day online in streaming audio), and taking calls from listeners to express their reactions. Yesterday's "Jack of All Trades" show elicited many powerful, moving comments as fans from various walks of life spoke, often through tears, about how relevant this new ballad is and how eloquently it addresses their own personal experiences. Just before beginning today's E Street Radio premiere of "Death to My Hometown," Marsh told listeners that he noticed his cell phone vibrating towards the end of yesterday's show. After he went off the air, he saw that he had been texted by the composer of "Jack of All Trades" himself: "Wow! What a show... Thank these folks for me. It was an honor hearing their stories. –B." As heard in "Death to My Hometown," the Alabama Sacred Harp Singers' "The Last Word of Copernicus," recorded by Alan Lomax. M.I.A. gives this one the thumbs-up, too. "Stand up and be counted tonight!" 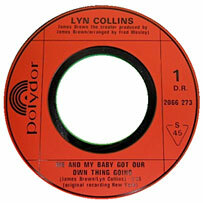 As heard in "Shackled & Drawn," Lyn "The Female Preacher" Collins' "Me and My Baby Got Our Own Thing Going" [James Brown/Lyn Collins, 1972]. Ludacris and Charli Baltimore like this one, too. A new discussion about the history of Asbury Park's West Side music scene — rhythm and blues, blues, jazz, soul — and its influence on Bruce Springsteen among others, will air this Wednesday, February 22 at 4 p.m. on SiriusXM's E Street Radio, channel 20. It's a two-hour program with appropriate musical interludes, including a bit of Bruce and all the participants live at the Wonder Bar from last April. The show will be rebroadcast that night at midnight, and again on Thursday, February 23, at 10 a.m. LISTEN TO "EASY MONEY" NOW! You've heard Wrecking Ball's opening track, "We Take Care of Our Own." Now, listen to track two, "Easy Money," streaming exclusively right here on Backstreets.com as we kick off a virtual tour of the new Springsteen album. Leading up to the March 6 release, a new song each weekday will reveal all eleven tracks from Wrecking Ball. Listen to "Easy Money" until midnight Monday, February 20. From there, nine other partner websites in the U.S. will pick up the ball, with a new song streaming daily to reveal the Wrecking Ball album in sequence. Look to Backstreets.com to be your tour guide for the next two weeks: We'll keep you posted on where to go to stream each additional track in the U.S., and with help from our friends around the world, we'll compile a list of sites where these songs can be heard internationally as well. Subscribers to SiriusXM Satellite Radio can also hear these songs on E Street Radio, as Dave Marsh spins each day's new track from 10 to 11 a.m. Eastern (repeating at 7 p.m.), Monday through Friday. During the live morning hour, he'll be taking calls to discuss the song on the air. By the end of the next two weeks, you'll have heard all 11 songs from the new record — put 'em all together on March 6, and we've got a complete statement from dare we say (sure we do) the greatest album artist of our time, one that tells a story from start to finish about the state of our nation and its people. 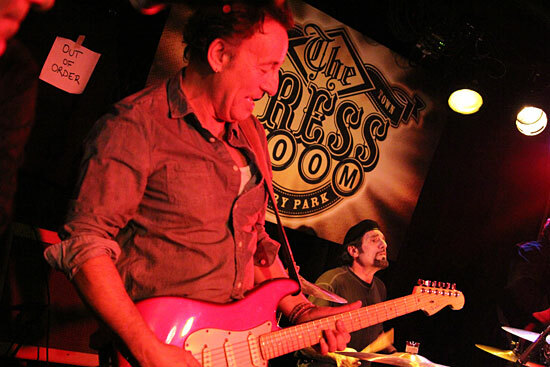 Now in its fourth decade, Backstreets Magazine has been covering the music of Bruce Springsteen, the E Street Band, and other Jersey Shore musicians since 1980. We've been called "The definitive chronicler of all things Boss" (USA Today)... "The gold standard of minutiae mags" (Chicago Tribune)... "The definitive source on Bruce Springsteen happenings... Respected, glossy and covers just about anything to do with Freehold's finest" (Philadelphia Daily News). The Seattle Times even called us "classy." Next, we're celebrating the life and music of... do we have to say his name? 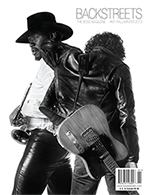 It's an issue you won't want to miss of the Boss Magazine, by Springsteen fans for Springsteen fans. peruse our back issues... and subscribe now! 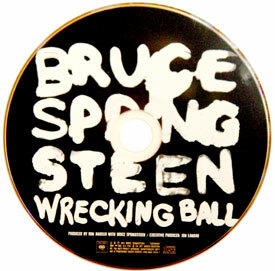 WRECKING BALL: "AS DIRECT A RECORD AS I EVER MADE"
Springsteen has talked with Andy Greene for Rolling Stone about Wrecking Ball, calling it "as direct a record as I ever made. That's with the possible exception of Nebraska, which this record has a lot in common with." 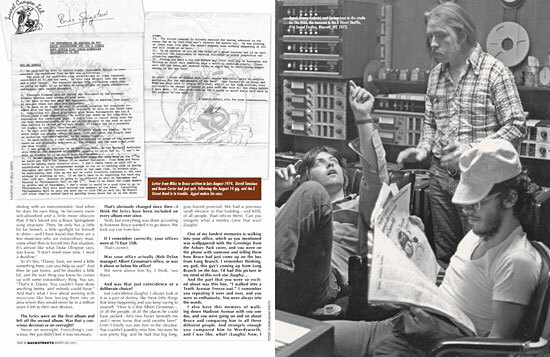 Greene gets Bruce talking about his process with producer Ron Aniello, too, before getting into the sounds and themes of the songs themselves. Read: "Bruce Springsteen Explains His Experimental New Album"
London Evening Standard: "Bruce Springsteen: The Boss is Cross"
"[We Take Care of Our Own"] asks the question that the rest of the record tries to answer which is, 'Do we?' — we often don't. I write carefully and precisely and I believe clearly. If you're missing it you're not quite thinking hard enough." AFP: "'I still back Obama' - but from the sidelines: Springsteen"
"I never campaigned for politicians previous to John Kerry and at that moment it was such a blatant disaster occurring at the top of government, you felt that if you had any cachet whatsoever, you had to cash it in because you couldn't sit around and watch it.... I'm not a professional campaigner and every four years I don't think that I'm going to go and pick a guy and go after him. I prefer to stay on the sidelines. I genuinely believe an artist (is) supposed to be the canary in the coalmine, and you're better off with a certain distance from the seat of power." AFP: "Angry Springsteen Gauges Gap Between American Dream, Reality"
"There is a feeling of patriotism underneath... in my best music, but at the same time, it's a very critical, questioning, often angry sort of patriotism. That's not something that I'm prepared to give up for fear that someone might simplify what I'm saying.... My work has always been about judging the distance between American reality and the American dream. How far is that at any given moment?" Irish Times: "A rare and reflective meeting with the Boss"
The Guardian: "Bruce Springsteen: 'What was done to my country was un-American'"
The Telegraph: "Bruce Springsten: I enjoy artists who take on the world"
CAREFUL WITH THEM GUITARS, BOYS! From Asbury Park to the Promised Land opens to the public today, and the Philadelphia Inquirer covers their hometown Springsteen exhibit in with behind-the-scenes video of the setup [above, by Tom Gralish], an article by music critic Dan DeLuca, a Top Ten list of must-see artifacts, and an essay by Amy S. Rosenberg. An official video from his Wrecking Ball press conference this week in Paris presents Springsteen talking about the themes and structure of his new record, along with first-listen snippets of "Easy Money," "Wrecking Ball," "Shackled and Drawn," "Jack of All Trades," and Clarence's sax in "Land of Hope and Dreams." Dig in! Jeff Kowalski writes in: "I just read your piece on the opening of the exhibit in Philly. My wife Penny and I had a great moment that night. We arrived as soon as the festivities began at 5:00 and quickly went into the exhibit. We slowly made our way through looking at all the amazing things (the rules for the Upstage club were one of my favorites). Nearing the end we were disappointed to see an empty glass case where the legendary Tele hybrid was to be displayed. Standing there and pining longingly for just a glimpse, two girls came out to rope off the area. They told us the guitar had arrived. "We took up residence in front of the case behind the ropes and saw Kevin Buell come walking in with a beat-up guitar case with the Thrill Hill address on it. Jim Henke comes out with his white gloves on (a little ironic considering what that instrument has gone through), and Kevin hands him the guitar. Jim looks up and sees the looks on our faces, and he brings the guitar over to my wife and I and displays it to us — inches away from my grubby working-class hands. I was just dying to ask if I could just touch it, but I retained my composure. That is one road-worn guitar! Absolutely beautiful. As Jim and the staff were mounting it I had a nice conversation with Kevin about the guitar and his job. Finally I was in the right place at the right time. A great night for us and a great start to the exhibit." 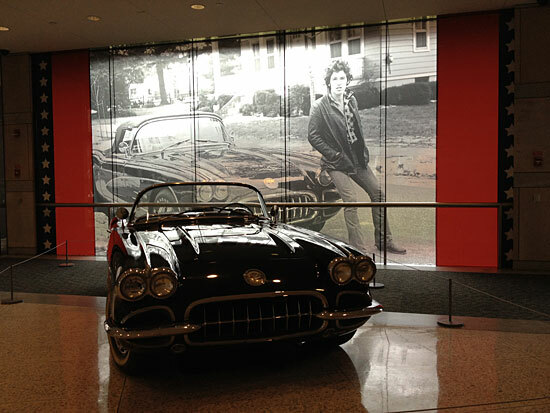 Philadelphia's National Constitution Center (NCC) hosted two special events yesterday to preview their exhibition of the Rock and Roll Hall of Fame's From Asbury Park to the Promised Land: The Life and Music of Bruce Springsteen. A press luncheon was hosted by the Center’s President/CEO, David Eisner. With representatives from many major media outlets present, Eisner's afternoon remarks to the assembled reporters included an unexpected and much-appreciated shout-out to Backstreets for our ongoing partnership with the Center in planning and publicizing various special events around the exhibit's Philly run. After the luncheon, reporters were treated to a special guided tour of the exhibit by Henke and key NCC staff, including the Center's Exhibit Developer, Erin McLeary. At that point, everything was in place except "the guitar." 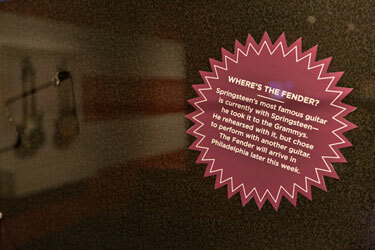 The space for Springsteen’s legendary Fender Esquire remained empty, as Bruce had ordered it held back for possible use in the opening performance of the 2012 Grammys, though another guitar ultimately was chosen for the live-television debut of "We Take Care of Our Own." Later that evening, hundreds of museum members and other invitees enjoyed a specially-themed opening celebration in the Center's beautiful main lobby. "Greetings from Asbury Park" was the theme, with several special guests including Asbury Park Mayor Ed Johnson, the only politician allowed to make a formal speech. Boardwalk-style foods and beverages served as the main course and dessert, and live music was provided by The B Street Band with special guest Vini Lopez, who also enjoyed his first-ever look at the exhibit. Oh yeah, the exhibit... Of course, the many Springsteen fans on the east coast and elsewhere who haven't seen it yet are in for a major treat. Those who got to see it in Cleveland at the Hall of Fame, however, also will enjoy re-visiting this "reboot" in Philly. Lots of small but very interesting enhancements, especially in drawing new connections between Springsteen's music and the concepts of freedom of expression and social conscience. This is the National Constitution Center, after all. A few items have been traded out for others, some different notebook pages are on display, and the physical layout itself is very different. Look for a more detailed report on the various changes in Backstreets issue # 91, coming soon. For now, we'll leave you with the happy news that by 6 p.m. or so last night, Kevin Buell had accomplished his latest mission and safely delivered "the guitar" from Los Angeles to its new temporary home on Arch Street in Philadelphia, just in time for the first group of non-press visitors. 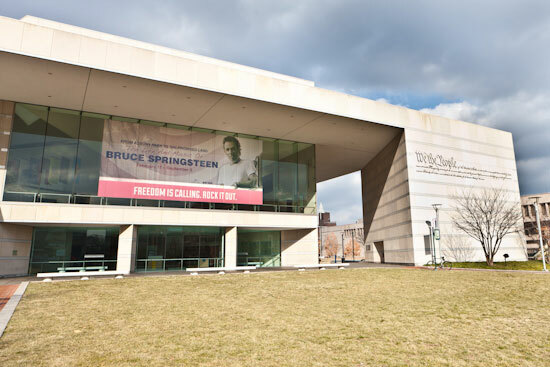 From Asbury Park to the Promised Land: The Life and Music of Bruce Springsteen opens to the public tomorrow and will run through September 3 at the National Constitution Center in Philadelphia. Click here or phone 215-409-6700 to purchase tickets. 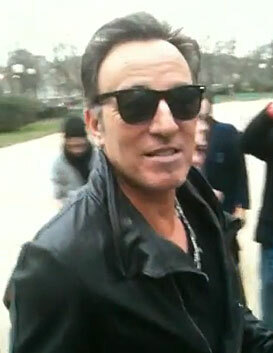 "You can never go wrong in rock 'n' roll when you're p---ed off," according to Bruce Springsteen. In Paris yesterday to unveil his new album, Wrecking Ball, to the world's media, Springsteen admitted it had been written in a spirit of political anger. "My work has always been about judging the distance between American reality and the American Dream." Right now, he suggested, the distance was greater than it had ever been in his lifetime. With the financial crisis, "an enormous fault-line cracked the American system wide open and its repercussions are just beginning to be felt." Read: "Bruce Springsten: I enjoy artists who take on the world"
The Telegraph also has a track-by-track review of the new album, for those who don't mind spoilers. Did you catch those Grammy audience shots of Steve Van Zandt in primo seats up front? "That's because Bruce and Patti give us their seats," he laughs in an interview with Rolling Stone's Andy Greene. "I haven't quite achieved that status on my own yet." On a second season for Lilyhammer: "Yeah, there's discussions about it. Netflix wants it. But I've got this other little logistical problem called the Bruce Springsteen tour. I gotta see how the hell I can do this. If we wait until the end of the tour to film it, we're talking 2014 for season two." On the new tour's horn section: "...it's going to fun for me, because as you know I'm a horn guy. So I'll be able to have some fun with our soul and R&B roots and emphasize some of that during that tour. And then we have the added bonus of keeping it somewhat in the family with Jake being the nephew." On Wrecking Ball: "It's interesting sonically and it does go to some new places, but it's not shockingly weird. It sounds like Bruce Springsteen, just doing some new things.... We learned the whole album in like a day. It's great, great, great stuff and easy to adapt to live." On the new repertoire: "...we're going on this tour with two new albums really. It's going to be really fun to play stuff from The Promise and the new album." On rehearsal shows: "What usually happens is we open up rehearsals near the end and bring people in. That's probably will be the same thing that'll happen here. We'll do something before The Apollo, I'm sure. You don't want to start with a live broadcast never having made it through the set. Even for us, that's a bit much — although we do like challenges. Read: "Exclusive Q&A: Steve Van Zandt on New Show, Life Without Clarence Clemons"
A special launch party today marked the official East Coast debut of From Asbury Park to the Promised Land, at Philadelphia's National Constitution Center. Both the Rock Hall-curated exhibit and the Morrison Hotel Gallery-curated "From Darkness to a Dream" exhibition of Frank Stefanko and Danny Clinch photographs will open to the public at the NCC this Friday, February 17. 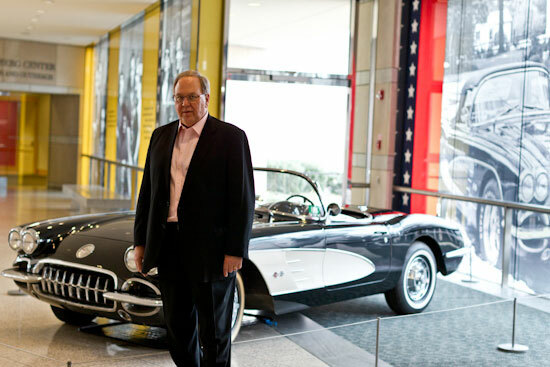 Frank himself was there today, and he sent us this image showing Bruce's 1960 Corvette in front of his own classic image of same from back in the day (yes, that's a Stefanko within a Stefanko). "Here's an early shot from the NCC exhibit," he writes, "This one is close to my heart." Backstreets was there too — watch this space for more from the NCC. It sure as f#*% ain't safe for work... but if you'd like to see a special Valentine supercut of Lilyhammer's Frank "The Fixer" Tagliano (AKA Steven Van Zandt) whispering his own brand of sweet nothings, click here. Congratulations to the E Street Band on the announcement of their induction into the New Jersey Hall of Fame. Bruce Springsteen was an inaugural inductee in 2008, and his longtime blood brothers follow four years later in the Class of 2012. (Taking notes, Rock and Roll Hall of Fame?) 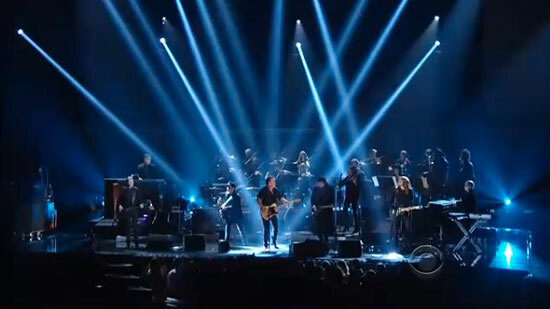 For the sake of the band's induction, the E Street Band honorees include current members Steve Van Zandt, Garry Tallent, Max Weinberg, Roy Bittan, Nils Lofgren and Patti Scialfa; those we've lost, Danny Federici and Clarence Clemons; and alumni Vini Lopez, David Sancious, and Ernest "Boom" Carter. This year's induction ceremony will be June 9 at the New Jersey Performing Arts Center in Newark — when Bruce and the E Street Band will be on tour in Italy. Since the voting regulations state that "any living inductee to the NJHOF must accept his or her award in person at the annual induction ceremony in order to be officially included as a member of the Hall of Fame," the E Street Band will likely be officially inducted at a later date. Two days before the E Street band tour kicks off, the State Theatre in New Brunswick, New Jersey will be hosting a very special screening of Bruce Springsteen & The E Street Band: Live From Barcelona on their massive, 46-foot, high definition movie screen. Tickets go on sale to the public on Friday, February 24, but you can take advantage of a special Backsteets.com pre-sale that begins this Wednesday, February 15, at 11 a.m.: Click here and use promo code backstreets. In addition to online, tickets will be available at the box office or by phone at (732) 246-SHOW. Tickets are only $9 in advance, and proceeds from the Friday, March 16 screening benefit the State Theatre Education Programs. From the E Street hiatus era, in 1992, one of our favorite moments from Nils Lofgren's long and storied career just happens to have a heartwarming guest spot from his once and future Boss. Happy Valentine's Day! Thanks so much or all your messages and tweets about the GRAMMYs. I can now reveal that I was asked to perform a Clarence Clemons tribute and then it got dropped to accommodate the tribute to Whitney Houston. Thanks to Glide Magazine/Hidden Track for the report. Congrats to Springsteen's art team at Columbia on the much-deserved win. I've yet to attend the first night of any Bruce Springsteen and the E Street Band tour, so being at last night's Grammy Awards at the Staples Center was about as close as I might ever get. And clearly, I'll never attend another Bruce show dressed in black tie, but that didn’t stop it from making it a stomp your feet and hands in the air kind of evening. Clearly, this wasn't your typical Springsteen crowd. I would roughly guess 90% of Grammy tickets distributed are to those in the music or entertainment industry, so it’s not exactly a group of folks clamoring to hear "Incident on 57th Street" or an extended version of "Kitty's Back." And if you're not sitting on the floor — and I wasn’t, even though I had terrific seats about halfway up and halfway back — chances on you're not going to be doing much standing during a performance. It's only after the song is over when everyone gets up and shows their appreciation. But back to Bruce. Having heard the day before that he would open the show, there wasn't much guesswork in wondering when he and band would show up. And as I kidded my wife after Bruce left the stage and there were still three-plus hours to go, "All right, time to leave." What may not have come through on television, but was fully evident in Staples in glorious fashion, was the soaring string section that elevated "We Take Care of Our Own." The mini-orchestra didn’t overpower that front-row lineup of guitars, but was a perfect accompaniment that gave the song extra firepower. I can only hope there will be some compilation of strings when the tour kicks off next month. It's a huge bonus. Watching Steve and Bruce share the mic reminded me of "Two Hearts," of course, and it provided a refresher for what it the E Street Band means: It's a living, breathing organism that is often forced to undergo changes and heartbreak, but it endures. And it thrives. Just before the final act, executive producer Ken Ehrlich came on stage to tell the audience they had put together a whopper of a finale. A few minutes later, after Paul McCartney stepped down from the piano and grabbed a guitar at the front of the stage, he was soon joined by Bruce, Dave Grohl and a few others. They closed the night with a mini jam session. While Erlich proved to be overstating the closer a bit, it was a wonderful opportunity to see Bruce share the stage with a Beatle. Legends passing each other in the night is a rare occurence — not only in the music biz, but in life itself. As for other Grammy highlights, there was lots of love in the room for Adele, whose "Rolling in the Deep" captivated the crowd. Her "aw shucks" personality felt just about right for an awards show where egos can often get out of control. And what should be noted is that both she and Bruce don't need elaborate stage effects, lighting or, yikes, even fire to illuminate their materials. It's the songs that matter. - February 13, 2012 - Stuart Levine is a longtime Springsteen fan and managing editor at entertainment trade paper Variety in Los Angeles. You can follow him on Twitter: Variety_StuartL. I LIKE THINGS THAT ARE GREAT: READY FOR THE 2012 E STREET DEBUT? Bruce Springsteen and the E Street Band will be opening tonight's Grammy Awards, their first public performance of the year. 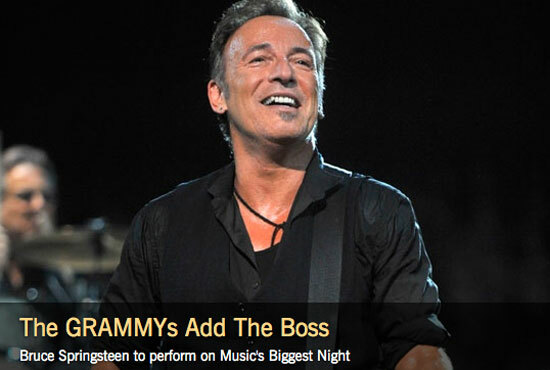 According to the Los Angeles Times, Bruce and the band were accompanied by a 14-piece string section for "We Take Care of Our Own" at Friday's rehearsal, when Tony Bennett "was guided by flashlight to a center seat in the nearly empty Staples Center" to watch the Boss rehearse. "''I like the way it looks, it's great, the stage,' the elder icon said with a smile. 'The song repeats itself a lot, though, doesn't it?'" Tune in at 8, and don't be late... tonight on CBS. Another key member of the Jersey Shore scene that gave birth to the Asbury Jukes and the E Street Band is gone. Bassist Vinnie Roslin, best known for his work in Child and as a founding member of Bruce Springsteen's legendary Steel Mill, died at his brother's home in Jackson, New Jersey; his condition had been terminal for several months. Roslin met Springsteen a year later at a battle of the bands competition at the Roller Drome in Matawan, New Jersey, where as a judge, he presided over both The Castiles and Sonny & the Starfires (featuring future E Streeter Vini Lopez). Roslin befriended Bruce at Asbury Park's Upstage, where, along with Lopez and Danny Federici, they formed Child (soon to be Steel Mill), but left the band to pursue other projects after an ill-fated road trip to California. Roslin later reunited with Lopez in such Shore stalwarts as The Shakes and J.P. Gotrock, and also was a member of The George Theiss Band for a time. Roslin's last major public appearances had been a couple years ago at tribute shows for fellow S.O.A.P. 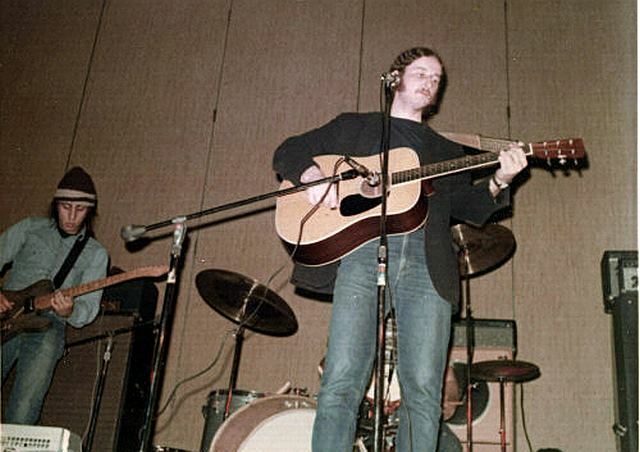 members Danny Gallagher and Danny Federici. "Vinnie was one of my oldest friends," says Lopez, speaking with Rose Montana. "He'll be sorely missed. I'm glad Tinker, Cal Vetrane and I went to visit him last week. I'm sorry he's gone, but he's in a better place. God bless him." Roslin was 65. A boatload of press in the last 24 hours regarding Springsteen's announcement of "additional musicians" for the Wrecking Ball tour. Which goes to show not only the current level of interest in Springsteen, but also in what Life After Clarence will look look like. Of course, there's the predictable (and we quote) "Bruce Springsteen and the E Street Band Replacing Clarence Clemons... With His Nephew!" 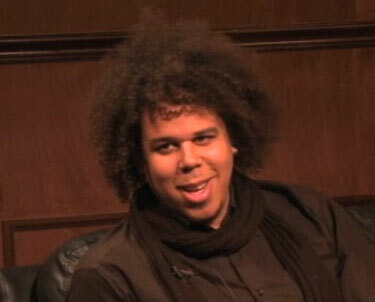 (Jake Clemons actually is Clarence's nephew, which is the one thing about that headline that's not off-base.) And we hereby vow never to call Jake "Little Big Man." For anyone looking for more online about Jake and his fellow sax man in the line-up, Asbury Juke/Miami Horn/Disciple of Soul Eddie Manion, we'd point you to Gary Gellman's "Jake Clemons, International Musician" interview at Gellman.tv, and the Eddie Manion section at southsidejohnny.com (including a 1984 recommendation letter from Little Steven). Says Eddie: "I went to Berklee College of Music in Boston for a year, but I really have to say that the music school I learned the most from was the Asbury Jukes School of Music. Because, as the Jukes, we were learning all the time, and it was like a music school in itself. My instructors were Steve Van Zandt, Bruce Springsteen, Southside Johnny." A promo clip created from stills got the lyrics out there immediately for the first single from Wrecking Ball (though a typo generated some confusion on the "cavalry" line), but we now have a full-blown, official music video for "We Take Care of Our Own." Directed by Thom Zimny, the clip was shot largely in the Savoy Theater, built in 1911 in downtown Asbury Park, and in The Press Room bar which opened last month, also in downtown Asbury, where Tim Donnelly is Creative Director. For insight into how Springsteen and Zimny go about putting something like this together, see our lengthy interview with the director in Backstreets #90. After the success of the first two Glory Days Bruce Springsteen Symposiums, in 2005 and 2009, it's just about time for a third. Returning to Monmouth University, the new home of the Bruce Springsteen Special Collection, the 2012 Glory Days will run from September 14-16. There will be pre-conference sessions and tours on Thursday, September 13, and evening musical performances at both Monmouth University and The Stone Pony in Asbury Park. This year's symposium is presented by the University of Southern Indiana, Monmouth University and Penn State University Altoona. If you are an educator, journalist, historian, musicologist, cultural anthropologist, sociologist, or political scientist, or if you are a fan with an interest in the scholarship regarding Bruce Springsteen, this conference is for you. The symposium web site can be accessed at www.usi.edu/glorydays. Check back often for details regarding speakers, performers, and agenda updates. Registration will open up in May. Proposals are now being accepted for presentations to the Glory Days symposium. For more information on symposium rubrics/tracks and to access the abstract management system, please visit the abstract section of the symposium web site. The deadline for submitting a proposal is April 30; you will know if your proposal has been accepted no later than June 1. For additional information about participating in Glory Days, see the announcement from organizer Mark Bernhard. President Obama digs Springsteen's new one, "We Take Care of Our Own." Or his campaign staff does, at the very least, selecting the track for a 2012 Campaign Playlst on Spotify. They also picked REO Speedwagon, so take it with a grain of salt... but it's a fun mix, as SPIN.com reports. This past weekend marked the final set of onsales for the first U.S. leg, as it stands, of Bruce Springsteen and the E Street Band's world tour. This is the first round of Springsteen tickets to be sold in the U.S. since the January 2010 federally-approved merger of Live Nation and Ticketmaster that created the Live Nation Entertainment monopoly, under which Ticketmaster currently operates. The men, operating as part of a company appropriately named Wiseguy Tickets Inc., are accused of bypassing Ticketmaster's CAPTCHA software ("the squiggly letters aimed at defeating automated programs") and buying thousands of tickets to various entertainment and sporting events that they then could resell at much higher prices, including "nearly half of the 440 general admission floor tickets for a July 2008 Bruce Springsteen concert at Giants Stadium." For yet another reason now, we fans are left to wonder what exactly will stop us from getting shut out and/or ripped off repeatedly in the future with the newly created Live Nation Entertainment and/or any of its so-called competitors who soon will share its software. Suffice it to say that this illustrates again exactly why we're keeping this page up and running as a tool for fans to use in continuing to oppose the effects of the Ticketmaster/Live Nation merger. As promised, the page indeed remains up and running — but to reflect where things now stand, we've just renamed the page "Fight the Monopoly! ", with a new post especially for NJ/NYC-area fans caught in the recent crossfire. We'll continue to keep that page updated regarding how the post-merger monopoly affects you and what we can do about it. With the exception of Clarence's nephew Jake, in for Stan Harrison, this is the same line-up that backed Bruce and the '78-era E Street Band at the Asbury Park Carousel House performance in 2010 (which bodes well for all of us hoping to hear material from The Promise on the new tour). Jake Clemons has guested with the E Street Band before, but this will be his first tour; the other sax player, Eddie Manion, has played with Bruce in various incarnations for decades. Welcome back, Kingfish! [Watch Ed take on the "Jungleland" solo last summer, above.] 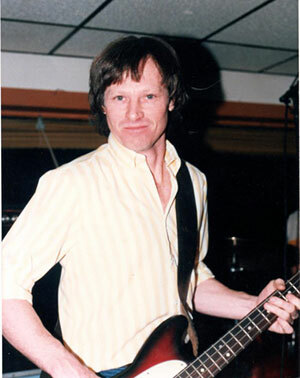 Curt Ramm was a featured player at the end of the Working on a Dream tour; he and Clark Gayton also toured with the Sessions Band. Barry Danielian is a relatively new addition to the fold. Also back for the Wrecking Ball tour, from the Working on a Dream and Sessions Band tours, vocalist extraordinaires Cindy Mizelle and Curtis King. Tickets for Bruce Springsteen and the E Street Band's first-ever visit to the Canary Islands are on sale today. The Las Palmas concert, scheduled for May 15, follows the tour opener in Seville, Spain. Tickets are available through ticketmaster.es (GA and seats) and entradas.com (GA only). It cannot be overstated just how jarring a release Nebraska was in 1982. The charts were being ruled by such vapid banalities as Olivia Newton-John's "Physical," Human League's "Don’t You Want Me" and Survivor's "Eye of the Tiger." Then along comes a quiet folk record made on an old 4-track, basically just voice and guitar about killers, small-time thieves and other forgotten souls. It took some major stones to release it. Read See's full piece here. And with the Nebraska record turning 30 this fall, this surely won't be the last of the looks back. Burke's Heart of Darkness book is in stock now at Backstreet Records. On Super Bowl Sunday, Little Steven Van Zandt appeared on the Bruce Brunch to talk with fellow DJ Tom Cunningham about Lilyhammer, E Street activity, and the E Street Band's own halftime experience three years ago. Tom says: "I solicited questions on my Facebook pages and was blown away by both the quality and quantity of the responses. The one that I ended up asking him yielded an amazing answer. It was Steven's fourth time on the show with me and I'm already looking forward to next time." Listen to the interview online. The lyric ends searching for that "brotherhood" we all know from Katharine Lee Bates' lyric to "America, the Beautiful." Springsteen asks, "Where's the promise/from sea to shining sea/wherever this flag is flown?" It reminds me of the way Marvin Gaye once sang the national anthem, turning it into a question about the country under which that flag waves. Read: "Love's on the Line: 'We Take Care of Our Own' and Springsteen's Promised Land"
[I]t's not like we’re going out there and playing a bunch of hits, and going through the motions. Then I would think twice. But we're not doing that. We're going out there as vital as ever, same enthusiasm as ever, with a terrific relationship with the most exciting audience in the world. So that motivates you. That keeps you going... I do have to make the time, and other things suffer. I could be parlaying this TV show into something bigger, or a second season, as you said, or whatever. Now that's gotta wait. So you do have to make decisions about that. That's a conscious decision. Other things will suffer because of the sacrifice I'm making to do this, and that's just my decision. That's what I want to do. Which is why we're particularly pleased, here at the Backstreets Towers, to keep getting the word out about all of Steve's goings-on. The entire first season of Lilyhammer premiered yesterday on Netflix for for American, Canadian and Latin American streamers. Now comes word that the show will be coming soon to the U.K. as well, with BBC Four having acquired the rights. And in its homeland, as reported on bbc.co.uk, "This new eight-part series set records when it launched in Norway last month, achieving the highest ratings ever for a drama premiere on NRK (Norway's public broadcaster)." Steven is also putting on his E Street Band hat to help out the Steven who wears the Rock and Roll Forever Foundation hat. Check out the Wrecking Ball Charity Experience Packages, particularly if you've been shut out of a show and/or have disposable income to spare. Options range from "Premium Seating" for $500 per ticket to the $25,000 "Adopt-a-City Package." Proceeds benefit Steve's effort to create and promote an interdisciplinary History of Rock and Roll curriculum for middle schools and high schools. Steven started the Foundation in 2007, with current board members including Bono, Martin Scorsese, and Bruce Springsteen. Find out more at rockandrollforever.org. DON'T MISS BACKSTREETS #90: SECOND MAILING THIS WEEK! If you've been considering subscribing to Backstreets Magazine, right now is an excellent time to sign up: our new issue, Backstreets #90, has already been sent out to subscribers, but this week we'll be doing a second mailing of this thick 84-pager to everyone who has signed up since then. Subscribe now, and your copy of our new issue will be on its way to you in a matter of days! 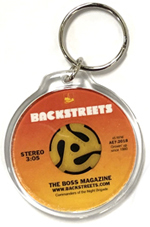 Backstreets#90, in glossy full color and packed with exclusive Boss coverage, is yours when you sign up now. Plus: the next issue, our big Clarence Clarence tribute, is going to be on its way to subscribers before the tour starts. Getting on board now guarantees you'll receive that issue, too, and ones to come. Subscribe now to guarantee your copy of the new Backstreets! FRANK TAGLIANO, WHEREFORE ART THOU FRANK TAGLIANO? We just started rehearsing, so all this stuff's going to be discussed and figured out over the next couple weeks, and we'll see. We'll see exactly what those answers are. Does the essential sound change? How does it change? How do you compensate for that, and all those kind of questions, I think, will be explored over the next couple of weeks. Read the full interview at avclub.com. This Saturday, February 11, will kick off a week-long anniversary celebration at Asbury Park's legendary Stone Pony, as longtime Jersey Shore fixture John Eddie will be debuting material from his upcoming release Same Old Brand New Me. The independently released CD, written and recorded in Nashville with session musicians, is somewhat of a departure for Eddie, who has spent the years since his 2003 release Who the Hell is John Eddie? on the road with his standout band of veteran musicians including local guitarist P.K. Lavengood and bassist Kenny Aaronson (Bob Dylan, Billy Idol, Joan Jett). Fresh off a standout performance at Light of Day 12, John is sure to deliver a solid mix of country, glam and rockabilly with his trademark self-deprecating humor and showmanship. He "just get[s] better and better," according to longtime friend and supporter Bruce Springsteen. Opening the show will be Michael Patrick, Sonic Slave, Justin Learner and Bobby Mahoney. 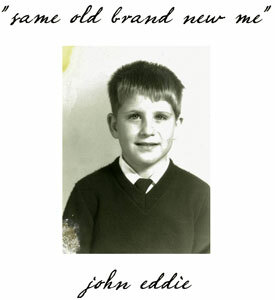 Same Old Brand New Me is currently available exclusively through johneddie.com; visit the site for info and tour dates. The following Saturday will feature the multi-talented Bobby Bandiera's annual headlining set at the Stone Pony. Guitarist Bandiera, currently on hiatus from both the Asbury Jukes and Bon Jovi, will lead his band, which currently includes bassist Graham Maby (Joe Jackson, Marshall Crenshaw), through a set of standards and originals celebrating the venue's storied past. The evening will also feature Stone Pony house band Outside the Box. Tickets for both events are available through Ticketmaster or at Experience Asbury Park, Boardwalk at Fifth Avenue. Albee Tellone, pictured above with a young Steven Van Zandt, was a regular at the Upstage in Asbury Park — he played with Bruce live and in the studio (that's "Albany Al" on baritone sax on "The E Street Shuffle"), and toured as his first roadie from 1972-'74. 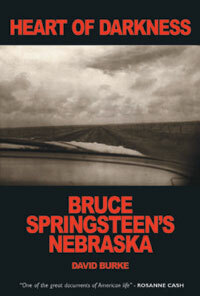 He's got a hell of a memory, too, and you can check out his memoir Upstage, Springsteen and Me for the Kindle at Amazon.com. Yesterday morning, Steve Van Zandt tweeted: "Going on The View in a minute. And people thought Howard was scary!" He made it through unscathed, though, promoting Lilyhammer and talking a bit about tour rehearsals, Clarence, his Rock and Roll Forever Foundation, and how to keep a rock 'n' roll marriage together for 30 years. Watch the Stevie segment above; there's also a web exclusive from the green room. With Lilyhammer debuting Monday on Netflix, Steve has been getting a lot of press this week, including the Chicago Sun-Times, the New York Post and Associated Press. And at this very minute, Steve is guesting live on Dave Marsh's weekly E Street Radio show, Live From E Street Nation. His dream full-album performance? Disc two of Tracks. He has yet to convince The Boss. If you've missed it, tune in for an encore broadcast Sunday at 8:00 p.m.
We post this not because it's an outtake from Wrecking Ball, and not to shill for Subway, but so that you can see Belmar's Joe DiMichele and his guitar from the 3:14 to 3:18 mark, representing the great state of New Jersey. The 54th annual Grammy Awards are ten days away, and Bruce Springsteen and the E Street Band have just been added to the line-up as performers. It's not a big Grammy year for Bruce — The Promise is nominated for its packaging (with praise due art directors Dave Bett and Michelle Holme) in the "Best Boxed Or Special Limited Edition Package" category — but Springsteen fans now have more reason to tune in, for what's currently scheduled as the first public E Street Band performance of the year. 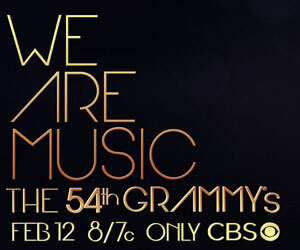 The Grammys will take place live on Sunday, February 12 at the Staples Center in Los Angeles and will be broadcast on CBS from 8–11:30 p.m. (ET/PT). Just announced: Springsteen and the E Street Band will play a pre-tour warmup show at the historic Apollo Theater in Harlem on March 9. 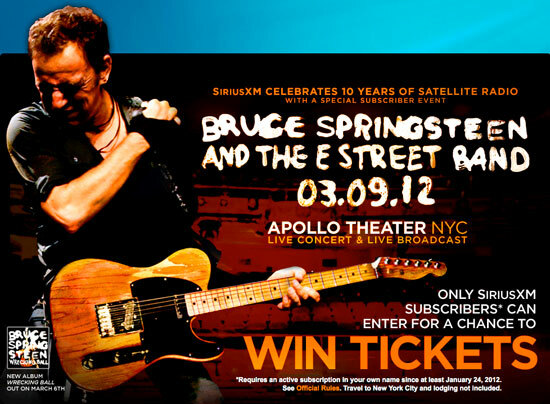 The concert is a SiriusXM "special subscriber event" — if you were a subscriber as of January 24, go to www.siriusxm.com/bruce to enter for a chance to win tickets. For everyone who doesn't get in (and the Apollo is a small venue), SiriusXM will be broadcasting the concert live on E Street Radio. Dave Marsh will also give away one grand prize travel package during his E Street Radio show, Live From E Street Nation, including four tickets to the concert, a paid trip to New York City, two nights lodging and the opportunity to guest DJ on E Street Radio. "We are proud and excited to celebrate ten years of satellite radio with one of the most enduring superstars of popular music, and true friends of SiriusXM, Bruce Springsteen and the E Street Band," said Scott Greenstein, President and Chief Content Officer, SiriusXM. "Bruce's music, now more than ever, reflects the attitudes and controversies, and the personal and national conversations of our time. This concert offers our subscribers the opportunity to hear Springsteen and the E Street Band perform in one of the most intimate and historic settings in the world." See the press release for further information, including WhyHunger as a beneficiary of the event. STEVIE: "I LOVE THE ALBUM. I JUST ABSOLUTELY LOVE IT." I'm going to let him talk about it but, basically, I will tell you this: I love the album. I just absolutely love it, I think you're going to love it and I think everybody else is too. The fact that a guy at his level of success, at his age, is still making records this vital and this relevant and this good, makes me just doubly proud to be his friend. I would love him anyway as a friend if he wasn't doing anything, but it really make me particularly proud to know him, that he would be this engaged, doing something this wonderful at this stage in the game. Behold, a new image from the Columbia one-sheet for Wrecking Ball. Sure, the cone of silence preceding the release of a Springsteen record can be frustrating... but there's fun in putting the pieces together, too. Following the official Wrecking Ball announcement a week-and-a-half ago, we've seen additional details pop up here and there: as you can see above, the addition of a subtitle to the bonus track "Swallowed Up (In the Belly of the Whale)," first spotted on iTunes. On Amazon.de, credits for players Art Baron (who played everything from tuba and trombone to tin whistle and mandolin in the Sessions Band) and the Victorious Gospel Choir. Germantramps.de turned up additional credits, and you can see the full known list (including guitarist Tom Morello on two tracks) annotated at Eddy Wehbe's springsteenlyrics.com. The Wikipedia page for the album lists track times, ranging from a 2:57 "This Depression" to a 7:03 "Land of Hope and Dreams." Even before digitization of the collection is complete, musicians, educators and others have been dipping into it. Bruce Springsteen’s new album, Wrecking Ball, due out in March, uses samples from the archive on two songs, and more than a decade ago Moby drew heavily on Lomax’s field recordings from the South for his hit album Play, as did the O Brother, Where Art Thou? movie and soundtrack. 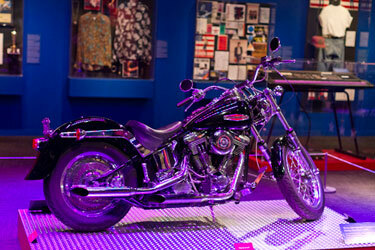 Philly Daily News report on the Springsteen Special Collection at Monmouth UI. "Why Springsteen Might Save Netflix"